“Ahhhhhh, how romantic! Who would guess that my raunchy little game had such a mood-inspiring vehicle? Change your flight direction with or on the Control Pad, and jump to fly higher! Be careful not to fall off! Magic carpets, also known as Pidgit’s carpets, flying carpets or just carpets, are magic flying carpets that have appeared in several games in the Mario franchise. Magic carpets originally appeared in Super Mario Bros. 2, where Pidgits fly on them. If Mario and the gang grab and throw or defeat the Pidgit, they are able to briefly ride it before it vanishes (Lakitu's Cloud would later act the same way, as of Super Mario World.). They are colored black and red in the NES version, yellow and white in Super Mario All-Stars, and red and white in Super Mario Advance; they are also stretched in the latter version, and thus appear larger than they were in prior versions. In the game's data, however, they are still the same size. They were again found in Super Mario 64 and its DS remake, only appearing on the stage Rainbow Ride. Unlike in the last game, these carpets are not ridden by Pigits and remain in place until the player steps on it. When stepped on, the carpet will follow a set rail, styled like a rainbow. If the player remains off of the carpet for too long, it will disappear and respawn back in its original position. Once it gets to the end of the line, it will fall into the abyss and then respawn back at where it started. In The Super Mario Bros. Super Show!, magic carpets appeared as a recurring mode of transportation. Mario, Luigi, Princess Toadstool, Toad and other characters used these carpets sometimes. In the episode "Mario's Magic Carpet", magic carpets appeared to have a car-like protrusion on the carpet. However, in the episode "Mario and the Red Baron Koopa", different carpets were seen. King Koopa was seen flying a magic carpet that had a warplane protrusion, while Mario and Luigi flew around on normal-looking carpets that had steering wheels. Later on in the episode, Mario, Luigi and Toad used two ordinary magic carpets together to construct the wings of a biplane. A flying carpet is used by Princess Toadstool, Mario, Toad and (depending on which route the reader takes) possibly Luigi to enter Iggy Koopa's secret laboratory in Water Land in Leaping Lizards. Three weeks later, some flying carpets are used in the first event in the International Mushroom Games, the obstacle course. In Koopa Capers, Bowser sends a magic carpet to Mario Brothers Plumbing to kidnap the Mario Bros., who he is desperate enough to ask to help in the search for his missing daughter. The carpet only captures Luigi (who had at first assumed the carpet was a gift and "a Goomba pattern rug") and proceeds to bring him to Bowser's Castle through the Mario Bros.' personal Warp Pipe. In Brain Drain, if Luigi punches the correct code into the KoopaFone in the Koopa Headquarters cafeteria, he will order a pizza from Magic Carpet Pizzas, a business run by Pidgits who deliver pizzas with their magic carpets. In the Game Boy Advance game Wario Land 4, flying carpets are found in the level Arabian Night. They are crucial for use if the level is to be completed. Wario can gain height and fly on these carpets by pressing on the D-pad. Two different Mario-themed stages featured magic carpets in Super Smash Bros. Melee. In Mushroom Kingdom II, 2D Pidgits sometimes briefly fly across the stage, but their red carpets are 3D and can be used as an extra platform. Since they come and leave from the left and right sides of the stage, it is very easy to self-destruct while riding one. They also appear in the Rainbow Ride-themed Rainbow Cruise, working as they do in Super Mario 64, though without the rainbow trails. However, more than one player can stay on a carpet, and as long as one player is on one, it won't vanish prematurely. As both stages return in Super Smash Bros. Ultimate, their respective magic carpets also come back, though the ones in Mushroom Kingdom II are now yellow (due to the stage's more Super Mario All-Stars-themed graphics). In the minigame Random Ride from Mario Party 5, players can choose to ride a magic carpet from a list of machines. A magic carpet simply titled the Flying Carpet is the starter vehicle of the Boo's Horror Castle board in Mario Party 9. In Mario Party: Island Tour, players use magic carpets to move through the Kamek's Carpet Ride board. In Mario Kart 7, a few Shy Guys can be seen riding magic carpets in various areas throughout the Shy Guy Bazaar course. 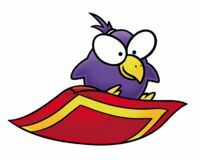 In "Mario's Magic Carpet", it was established that carpeting is the favorite food of Pidgits. In The Super Mario Bros. Super Show!, Sam Shalam of Cloud Land is a used magic carpet dealer. ↑ Super Mario Advance North American instruction booklet, page 31. ↑ Super Mario Bros. 2 Inside Out, Part II. Pages 9 and 10. ↑ Super Mario Bros. 2 NES instruction booklet, page 25. ↑ 4.0 4.1 Wario Land 4 European instruction booklet, page 8. ↑ Wario Land Advance: Yōki no Otakara Japanese instruction booklet, page 11. ↑ 7.0 7.1 Wario Land 4 European instruction booklet, page 88. ↑ Wario Land 4 European instruction booklet, page 48. ↑ 9.0 9.1 Wario Land 4 European instruction booklet, page 28. ↑ 10.0 10.1 Wario Land 4 European instruction booklet, page 108. This page was last edited on January 26, 2019, at 13:16.